Ramnad Krishnan was probably the first musician to be given the epithet, "musician's musician". 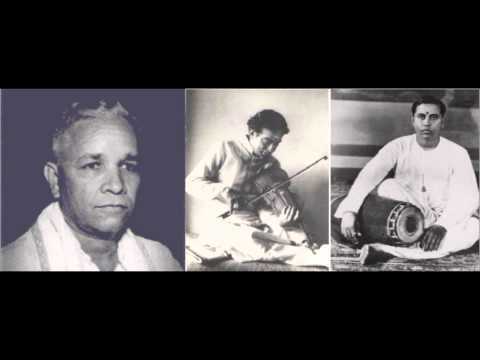 His music was marked by an ease of rendition that often belied the effort that went into making the vidwan, and made musical nuances seem like an easy thing to accomplish. Krishnan did not belong to Ramnad, though. He was born in Alappuzha (Alleppey) in Kerala, and his music too had the fluidity of the waters of the Alappuzha lagoons. He was one of six brothers, all of whom made a mark as Carnatic musicians. His eldest brother, Lakshminarayana was a violinist, and Easwaran and Raghavan were mridangists. Krishnan was a student of Ramnad Sankara Sivam, and that's when he became Ramnad Krishnan. If GNB considered Ariyakudi as his maanasika guri, it could arguably be said that Ramnad Krishnan considered GNB his maanasika guru, and his singing shows the GNB influence. It was his association with the Dhanammal school of music that gave Ramnad Krishnan's music the character that became his hallmark. This was also the turning point when he turned to the relaxed approach to singing, or sankhya, as it's called. The burnishing of his music began with this. Whether it was a sahana, yadukula kamboji, kapi, or bhairavi, the ragas reflected the same sense of ease, the smoothed out contours, which made his music reach out to both the heart and the mind, with the restrained intellectual and emotional content feeding off each other. When Ramnad Krishnan passed away in 1973 at the age of 54, it was way too soon. Surely, he was still growing as a musician. It would be worthwhile conjecture to think, as in the case of GNB who incidentally was a big influence on Krishnan, what Krishnan's music would have been like if he had lived another two or three decades.